Another great salad recipe concocted by my mother in law and a family favorite. 3. In a bowl, add the papaya along with 1/4 diced red onion and a handful of fresh chopped coriander leaves. Mix well using a spoon. 4. In a food processor, mix together the juice of 1 fresh lemon, 2 tbs of lemon juice, salt and sugar to taste. Try with 1/2 tsp salt and 1-2 level tsp of sugar. Test for taste. 5. 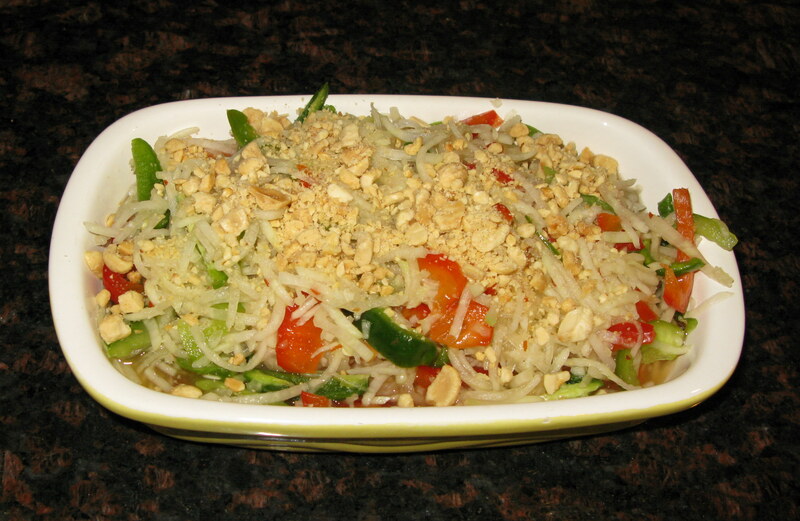 Pour the papaya salad into a serving dish and pour the blended mixture over the top. If you wish to add chilies to the salad to give it a bit of a kick, finely slice them and sprinkle over the top of the dish. 6. Sprinkle the remaining 1/4 of the red onion which you diced earlier over the top to add further color. 7. 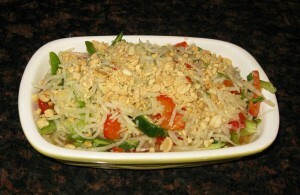 Just before serving, sprinkle a handful of crushed peanuts over the salad along with some fresh coriander. (If you have a peanut allergy, just omit this part).